KELLER, TX, USA, April 12, 2019 /EINPresswire.com/ -- Keller, TX/April 12, 2019 - Crushed To Restored: Principles Of Restoration From The Book Of Nehemiah (ISBN 978-1-59755-499-2, Advantage Books, 2019) by Dr. Feyi Obamehinti has been released for worldwide distribution. This critically acclaimed Christian book draws from the teachings found in the Book of Nehemiah and offers core principles for individuals to be restored in faith and healing from any loss or abuse that they may have experienced. 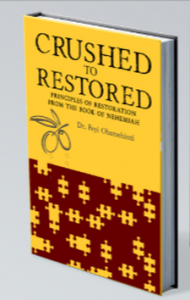 Written in easy to read style, Dr. Obamehinti includes her own personal journey and how the concepts of the Book of Nehemiah allowed her to recover; and grow spiritually and personally from her own agonies.